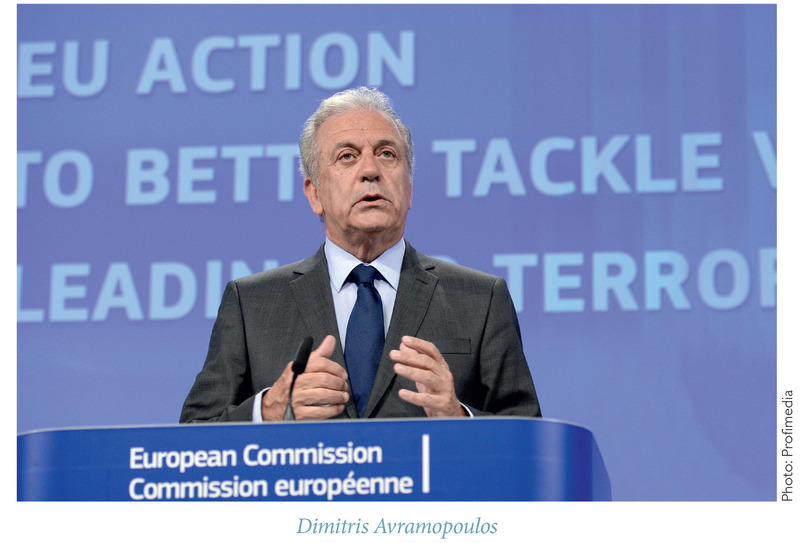 Dimitris Avramopoulos is EU Commissioner for Migration, Home Affairs and Citizenship. 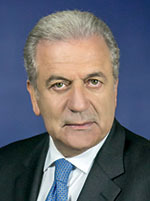 You may follow him on Twitter @Avramopoulos. Security and migration are highly visible policy areas around the globe, with a tangible and visible impact on the everyday lives of citizens. In dealing with both policy areas, citizens expect clear added value and effective joint responses from the European Union. That is why, over the past two years, the mounting challenges of managing migration and improving security have come to dominate the political agenda. Responding to these challenges, both in Europe and around the world, has not been an easy task. The migration crisis—with the dramatic increase of refugee arrivals in EU countries, as well as in Turkey, Jordan, and Lebanon—and the precarious security situation, exacerbated by the horrific terrorist attacks in Paris, Brussels, Nice, Orlando, Istanbul, and Baghdad, may be happening at the same time, but they are, in fact, distinct phenomena. That being said, both challenges, however, require a firm and effective European and global response, built on a common foundation: shared values, mutual trust, and stepped up cooperation. This common foundation has to be built not only within the European Union—with the engagement and commitment of its Member States—but also between the EU and its allies and partners around the world, in a spirit of responsibility and solidarity. Migration is an integral part of our globalized and interconnected world. Millions of people move around or live abroad for personal or professional reasons. The movement of individuals is an integral part of human history and will only grow in importance across the world as populations grow, technology and mobility improve, and regions continue to face conflict. Today, more than 60 million people are forcibly displaced. Some of these have fled war or terror, whilst others have been born into displacement and know no other life than that of being a refugee. We are dealing with a refugee crisis of an unprecedented scale, and its challenges are shared by the entire international community: saving lives, offering protection, combatting human traffickers, managing irregular migration, and addressing root causes. The objective is not to stop migration—because we cannot—but instead to strive to reduce human suffering, such as deaths at sea, and deal with those whose lives are characterized by legal limbo and irregularity. The appearance of the first ever Refugee Olympic Team at the Olympics in Rio de Janeiro has shown that being displaced should not mean paralysis or exclusion—on the contrary. However, it also reminds us that no one should be a refugee forever, and that, in the end, we should aim to let these people play for their original national teams or for their new home countries—if return is deemed no longer possible. In May 2015, the European Commission presented an ambitious European Agenda on Migration, in an effort to respond to immediate and long term challenges—both inside and outside the European Union. Its objective is to create a fairer and more sustainable migration policy. The first step has been to help the EU’s frontline Member States, such as Italy and Greece, by strengthening search and rescue operations—for instance, the Frontex joint operations Triton and Poseidon—and launching the first ever relocation schemes to disperse 160,000 refugees from Greece and Italy to other EU countries during a two-year period (September 2015 to August 2017). In order to make this happen, the EU has set up so-called ‘Hotspots’ for migration management in Greece and Italy, where the European Asylum Support Office (EASO), the EU Border Agency (Frontex), the EU Police Cooperation Agency (Europol), and the EU Judicial Cooperation Agency (Eurojust) are working on the ground in designated areas with the authorities of the two countries to help them swiftly identify, register, and fingerprint incoming migrants, as well as to implement the relocation schemes. As of end of September 2016, more than 5600 relocations have taken place, though many more will need to occur swiftly in the coming months. In addition, in December 2015, we proposed that Frontex be turned into a fully-fledged European Border and Coast Guard, so as to better manage the EU’s external borders. In six months this has become a reality: from now on, we will have a genuinely collective European management of our borders, based on the principle that the security of one external border of one Member State is the security of all our borders. On October 6th, we are launching the European Border and Coast Guard officially. If we truly want to address the short and long term challenges of migration, we must become more effective in engaging with our international partners, including the countries of origin and transit. A turning point in managing the migration flows to Europe was the breakthrough agreement with one of our key partner countries: Turkey. On March 18th, 2016, EU Heads of State or Government and Turkey agreed to end irregular migration from Turkey to the EU by replacing it with safe and legal channels of refugee resettlement into the European Union. From a high of almost 2,000 daily arrivals to the EU from Turkey in the first months of 2016, we now have an average of some 90 persons per day. The sharp decrease of people crossing the Aegean irregularly from Turkey to Greece is proof of the EU-Turkey Statement’s effectiveness so far. So far, more than 10,000 refugees have already been resettled, including more than 1,600 under the EU-Turkey Statement. On the flipside, almost 500 migrants have been returned to Turkey since the Statement became operational, out of more than 1,500 returns in 2016 from Greece to Turkey. The continued success of the Statement’s implementation will depend mainly on the political determination of all involved parties: both sides need to deliver on and uphold their political commitments. The EU will continue to implement the Statement, and we expect Turkey to continue doing the same. Drawing on our recent experience, the European Commission proposed a new Partnership Framework in June 2016 for across-the-board cooperation on migration with third countries. Through this new framework, we want to develop ‘compacts’ tailored to each partner country’s specific circumstances and needs—whether it be a country of origin or transit, or one that hosts a large refugee population. This approach will help bring about tangible benefits—for refugees, third-party countries, and our own citizens. An essential component in the global governance of migration—and one the European Union will strive to promote—is to make return and readmission processes work effectively. Obviously, all returns must take place in a dignified manner, in full respect of EU and international law. In the end, any return policy is designed to avoid having to return people in the first place by addressing the root causes of migration, fighting human traffickers, and creating better livelihoods in countries of origin and transit. At the same time, the prospect of being returned swiftly can be dissuasive for irregular migrants. It could dissuade them from engaging in dangerous journeys to Europe, as well as deter the criminal smuggling networks that prey on their vulnerability. Last year, the EU developed an Action Plan against Migrant Smuggling 2015–2020, aimed at reducing irregular migration. The Plan aims to accomplish this through direct action against criminal networks of human traffickers, capacity building, and information campaigns targeting potential victims of smuggling and trafficking. An essential part of the wider objectives of the European Agenda on Migration has been to make our migration policy future-proof. It is for this reason that we have presented a comprehensive overhaul of the Common European Asylum System—including a revision of the Dublin Regulation with a European Asylum Agency and the necessary changes for fingerprinting under the Eurodac Regulation—as well as more enhanced harmonization of asylum qualification, procedural and reception condition rules. We want to eliminate fragmentation and gaps in all of our policies, including migration. The goal is develop a uniform European system for resettlement; this is why we have presented a Union Resettlement Scheme to pool all our offers and act as one. In light of the EU’s actions in managing the migration crisis, some may assume that Europe is trying to close its borders to foreigners. This could not be farther from the truth. In a globalized context, the EU should stay true to its tradition of an open culture, welcoming not only those who need protection, but also those who can and want to contribute economically. We recently adopted new and improved EU-wide rules on admitting third-country students, researchers, volunteers, and au-pairs—all to further increase opportunities for young people from all over the world to come to the EU. We also provide scholarships for thousands of non-EU students and researchers every year under the Erasmus Plus program. Moreover, the European Commission has proposed a revision of the EU Blue Card Directive, in order to make it easier for highly-skilled workers to come to Europe. At the same time, the EU must invest more in all migrants who have a right to stay in the EU, whether they are recent arrivals or have been in our countries for some time. As European societies become increasingly diverse, the Commission has encouraged all Member States - through its Action Plan on Integration - to invest in integration policies today, so that we can all live in a more prosperous, cohesive, and inclusive Europe tomorrow. We have already significantly increased funding for migration management over the past year. Moreover, in the draft EU budget for 2017, we have proposed that €5.2 billion be devoted to reinforcing external borders and addressing the migration crisis both inside and outside the EU. Looking at the long term challenges, we also need to do more to improve opportunities in countries of origin, so that people are not compelled to leave. For that, we need to reconsider our traditional models of development cooperation, and give a much greater role to private investors. A new External Investment Fund, with the aim to crowd-in private investment in developing countries, could provide the means to address the root causes of forced displacement and economic migration. Such cooperation should be multidimensional: we need more financial support, but we also need long term structural solutions—for the nations that are disrupted by instability, the countries of transit and destination, and the vulnerable people that are seeking refuge. At the same time, we should not forget that the current crisis is not only a European one: it is a global one. That is why a global approach on migration and international protection, as promoted by the EU, has been central to the discussions at the September 2016 UN General Assembly. In an era in which terrorism and other serious criminal elements operate across national borders, both the European Union and its Member States have a responsibility towards their citizens to deliver an effective internal security system, in which individuals are protected in full compliance with fundamental EU rights. Our Member States have the front line responsibility for security, but they cannot address transnational threats effectively by solely acting on their own. That is why, at the European level, we need to build the tools, infrastructure, and environment in which national authorities can work together effectively to tackle shared challenges: an effective and genuine security union, in which the rights and freedoms of citizens are well protected. Europe faces the most significant terrorist threat in recent memory. When it comes to terrorism, the internal security of one Member State is the internal security of all Member States. In the security field, as in many other areas in Europe, fragmentation makes us vulnerable. Terrorists are determined and committed to destabilizing our societies. They want to harm the core values of Europe in the name of distorted and violent ideologies. To face up to this threat, Europe needs a genuine Security Union. In such a union, a police officer in one Member State should have the same capacity to share relevant information with colleagues over the border as one would with fellow officers within one’s own country. This requires change in two respects. At the European level, we need to urgently address the remaining gaps, fragmentation, and operational limitations of information exchange tools currently in place. We must make sure that structures for cooperation are as effective as possible, and that European legislation tackles terrorist criminals and their activities robustly and in an updated manner. This is necessary in order to create an environment of confidence among national authorities, as well as to create the legal and practical tools to allow them to work together in addressing common challenges. The full added value of an effective Security Union depends crucially on what use is derived out of these tools and structures in closing any future operational loopholes and police intelligence gaps. This, in turn, will require a culture change at the Member State level, so that respective law enforcement authorities can acquire the habit of systematic cooperation and information sharing, right down to the last police officer. A sense of common responsibility, along with the will and capacity to turn that into action, is essential if we are to overcome the fragmentation which terrorists and criminals have been exploiting so effectively. The EU’s response to the security situation is threefold: (I) creating the structures for optimal cooperation and information exchange across borders between its Members; (II) upgrading its legal framework so that it can adequately confront the challenges at hand; (III) implementing concrete tools and actions to address specific threats. As for structures, in January 2016 we launched the European Counter Terrorism Centre (ECTC) at Europol. By serving as an operational center of law enforcement expertise, the ECTC focuses on tackling foreign fighters, sharing information and expertise on terrorism financing, ensuring the swift removal of online terrorist propaganda, addressing illegal arms trafficking, and contributing to international cooperation. The ECTC has already demonstrated its operational added value by providing immediate analytical and operational support to Member States hit by major terrorist attacks (e.g. France and Belgium). Also within Europol, we have established an EU Internet Referral Unit to help reduce the volume of terrorist material online. Finally, we have expanded our capacity to address violent radicalization by stepping up our work with our Radicalisation Awareness Network, in the form of a Centre of Excellence, and launching voluntary cooperation and dialogue with major internet and social media companies. We are also in the process of upgrading our legal framework in key areas, such as firearms and the criminalization of terrorism. This process has been initiated in order to make it harder to acquire firearms in the EU and to close criminal enforcement gaps by setting common definitions of what constitutes a terrorist offence. Finally, in terms of concrete operational action, we have set out ambitious action plans against firearms trafficking and terrorist financing. The sourcing of contraband weapons from neighboring regions remains a major problem, while the risk of new sources emerging also has to be minimized. With regard to terrorist financing, we are going after the money by disrupting sources of revenue, and detecting and preventing terrorist organizations from moving funds and other assets. This will ensure that financial institutions can help law enforcement trace terrorists before their acts are committed. At the same time, our efforts on security cannot be limited within the EU’s borders. Strengthening our relations with partner countries in the area of counter-terrorism is a sine qua non. We are, thus, deploying security and counter-terrorism experts in EU delegations in Turkey, Jordan, Lebanon, Algeria, Morocco, and Tunisia. We have also launched, targeted, and upgraded security and counter-terrorism dialogue with Tunisia, Lebanon, Jordan, Egypt, and Turkey. Fostering strong links with partner countries provides the basis for concrete cooperation in areas of common concern, including terrorist movements, firearms, radicalization, terrorist financing, and aviation security. We are also furthering our partnerships with Western Balkan countries, with a focus on countering firearms and radicalization. It goes without saying that our strategic security partnership with the United States is at the heart of our global efforts. Our cooperation is constantly deepening, with daily operational cooperation and information sharing between American law enforcement agencies and Europol. The recent terrorist attacks in Europe have made one thing clear to all EU Member States: we will not be able to address terrorism by looking inwards. If we want to start moving toward a genuine and effective Security Union, we must start with more trust and more sharing. In Europe, the time has finally come for a culture change, and for swift delivery. We will start doing this at a very practical level. Much like the United States after the 9/11 attacks, we have presented a strategy to improve information sharing structurally and strategically. The next year will be critical for our next steps in this area. Last month, we also announced that we will work to reinforce and further strengthen operational cooperation in the area of counter-terrorism. We will work with Europol to further strengthen the agency’s counter-terrorism capabilities, but also its work against migrant smuggling and cybercrime, for example through providing the additional resources needed to meet the needs and expectations placed on it. Improving Europol’s access to key databases is also important. In the same vein, we encourage our Member States to facilitate some form of information exchange hub to create a platform where authorities obtaining information related to terrorism or other serious cross-border security threats would share it with law enforcement authorities. Beyond that, the intention of President Juncker to give the EU Commissioner from the UK, Sir Julian King, a strictly defined role in the Security Union demonstrates the importance that the Commission attaches to stepping up our response to the terrorist threat. Sir Julian will bring fresh ideas and a wealth of experience to reinforce our ongoing initiatives on the Security Union, and, by focusing on concrete operational measures, he will support my work as Commissioner for Migration, Home Affairs and Citizenship. The EU has been working tirelessly to lay the building blocks for sound and effective migration and security policies. While important milestones have been achieved over the past year, we still have a lot of homework ahead of us, not least starting with the implementation of the newly created European Border and Coast Guard—which will complement both our migration and security efforts. Once up and running, the European Border and Coast Guard will provide the missing link to strengthen Europe’s external borders, so that people can continue to live and move freely in an area with no internal borders. Most importantly, with the European Border and Coast Guard, Europe will treat the protection of its borders as a common mission of shared solidarity and responsibility. In fact, this is our ultimate goal in all our migration and security efforts, both within the EU and globally: to establish a common mission and a shared vision in a spirit of solidarity and responsibility. If we want to be serious and credible in all of these efforts, cooperation is the only way forward.